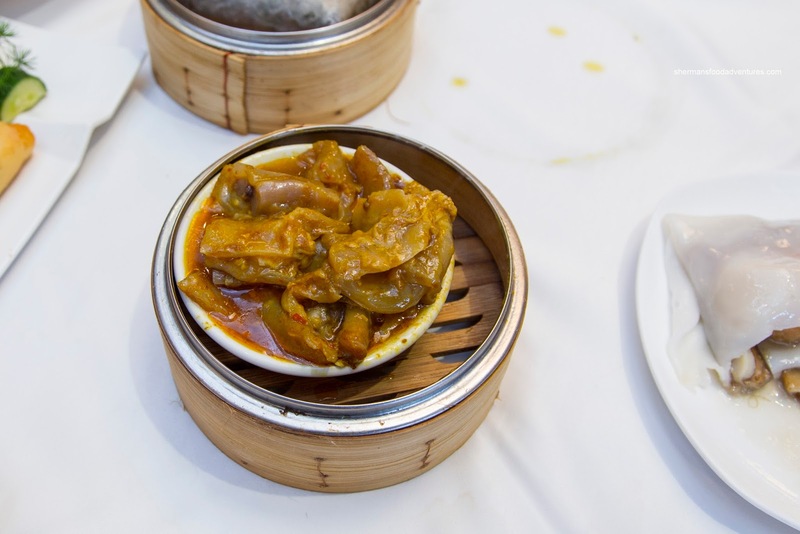 When I was younger, I vividly remember going for Dim Sum every weekend with my parents. There weren't many choices back then and I was well-aware what a luxury it was to go every week, sometimes twice a week. 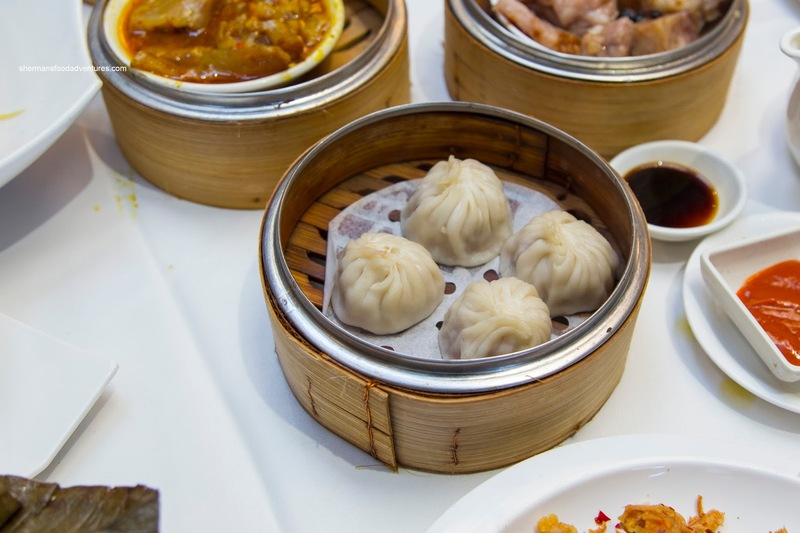 Then in the 90's, an explosion of Chinese restaurants helped keep the cost reasonable and at times, it seemed to be less expensive than before. However, as we moved into the 2000's, we witnessed an increase in higher-class Chinese establishments that pushed the prices upward. 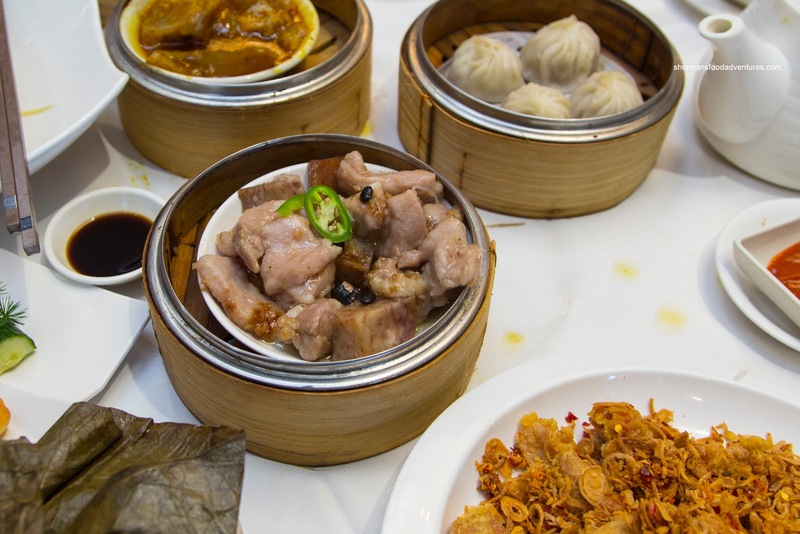 Then more recently in the past decade, we've seen the ultra-expensive Dim Sum spots open up where a steamer of Ha Gau is pushing close and sometimes exceeding $10.00. 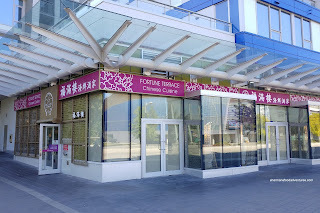 So when Fortune Terrace opened up across from the Olympic Oval, I wasn't super interested as it was another fancy and expensive Chinese restaurant. However, my curiosity can never be denied, so we finally ended up trying the place out with my parents. We began with the Pea Tips with dried scallops & shrimp in soup. 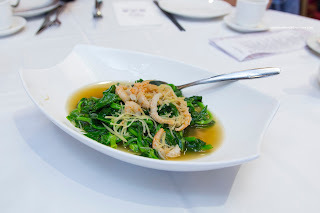 This was prepared properly with tender pea tips that were still crunchy and vibrant. They were mildly seasoned but with the generous amount of briny & salty dried shrimp and scallops, there was enough impact. When I marked off the Baked Egg Yolk Paste Bun down on the checklist, I knew it would arrive before it was time for dessert. 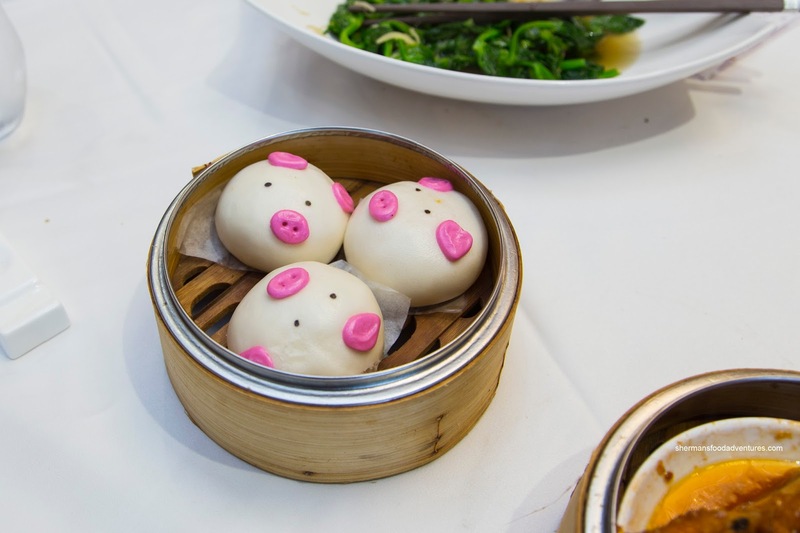 I didn't mind as I knew they were in the shape of cute little piggies. Appearance aside, these were good being fluffy and soft. Inside, the runny but not thin, yolk custard was purposefully sweet while creamy. Looking over the menu, it was strange that I could not find the usual rice noodle rolls. Rather, we took a chance and ordered the Supreme Three Treasure Rice Roll and it arrived as a large square. Inside, there was eggplant, silky tofu and scallops. This was overstuffed as there was more ingredients than rice noodle. The noodle itself was actually quite thin while exhibiting a great deal of elasticity. Hence, it was on the chewier side, but I didn't mind it. 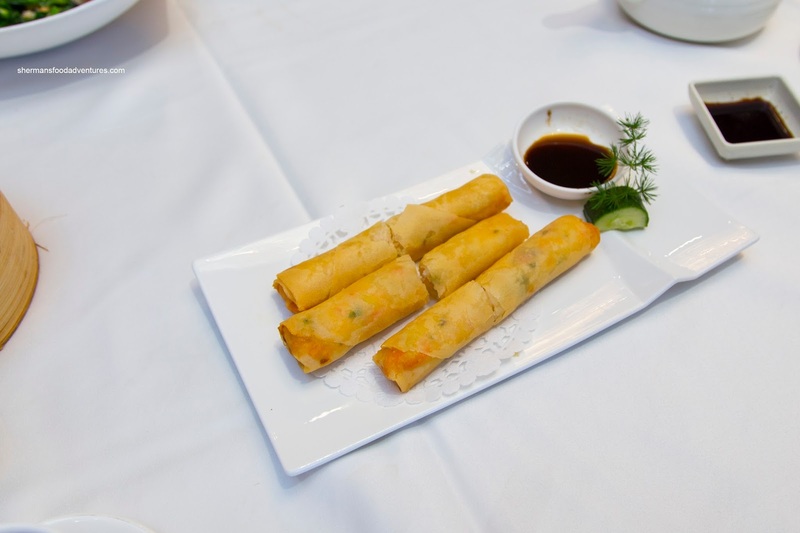 Naturally, Dim Sum wouldn't be Dim Sum if we didn't order Shrimp & Chive Spring Rolls for my son. This was also good with a firmly crunchy exterior that was easy on the grease. 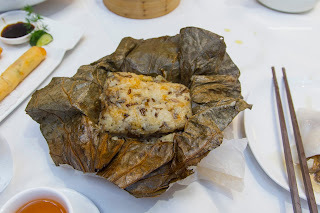 Inside, the whole shrimp filling was moist while having a sweet snap. It was seasoned enough without being salty. 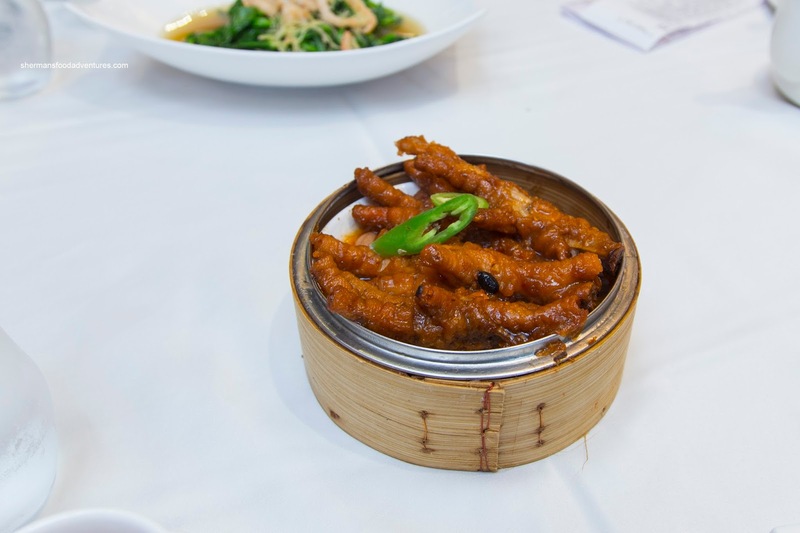 Off to some more typical items, we had the Steamed Chicken Feet in Supreme Sauce. If you look closely at the picture, you will noticed that these were some pretty large feet. As such, they were also plump and on point texturally. The skin was tender while not mushy where the cartilage and fat underneath was buttery, yet not melted. I wasn't sure what they meant by supreme sauce, but it did taste good with the usual sweet and salty thing going on aided by garlic. Consisting of mostly meat portions, the Steamed Pork Rib & Taro in Garlic Sauce was executed nicely too. Each piece of rib was tender with a perfect bounce texture. There was more than enough seasoning including a good hit of garlic and the saltiness of black bean. The taro, on the other hand, was not so good being dry and powdery. Arriving as one large Lo Mei Gai rather than the more common 3 mini-versions, it was a pleasant surprise. For me, I like the ol' skool large type due to the overall texture and moisture. 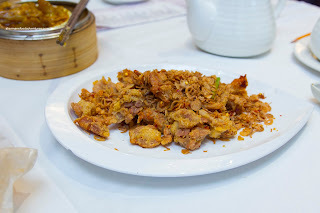 This one featured plenty of ground pork, chicken, salted egg yolk and mushroom for both texture and flavour. The intermittent wild rice added a chewier texture to the soft and glutinous rice. Looking like a dish of fried shallots rather than Deep Fried Chicken Knees, it was rather deceiving. There was actually a bevy of well-sized chicken knees hidden underneath. They were crispy while succulent inside. Despite the amount of shallots and chili flakes, the flavours were muted and more aromatic than anything else. It could've used a bit more salt and pepper. Normally, with Ha Gau, we would order the ying to the yang with the Siu Mai. However, they left it off the original ticket and even after a reminder, they still didn't put it in. Oh well... As for the ha gau, they were good. 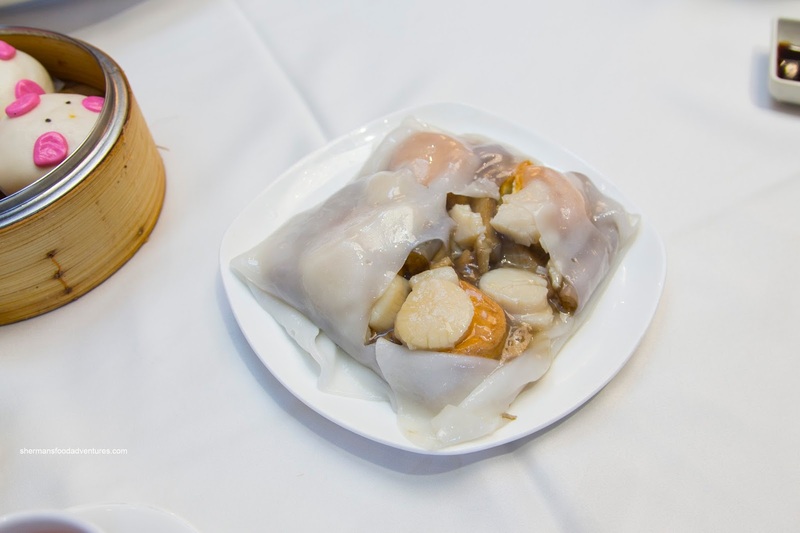 Enveloped by a chewy, yet tender dumpling skin, the whole shrimp filling was meaty with a sweet snap. There was only a mild amount of seasoning (including noticeable sesame oil), so that it didn't overwhelm the shrimp. 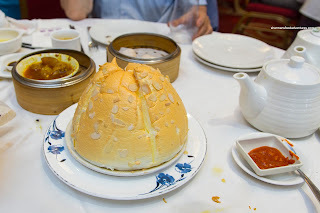 Once again, we got the Xiao Long Bao despite it probably being so-so in a Cantonese restaurant. That it was with a thick skin that was doughy. However, on the inside, the pork filling was succulent and tender. It was more sweet than savoury with only a small amount of soup. Our obligatory offal dish was the Steamed Beef Tendon in Curry Sauce. I found most of the pieces to be on the softer side where some parts were melting. My mom liked it, but I personally like some texture left rather than a mush. Flavourwise, I found the curry to be present in a mild manner. For our actual dessert, we went for the visually-impressive Souffle with Almond Flakes. 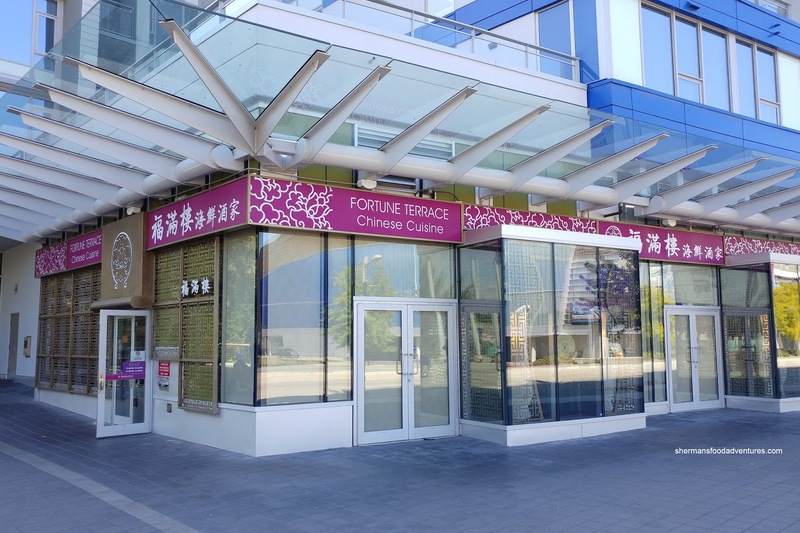 This featured a sweet and chewy exterior that gave way to a soft and airy centre. It was only purposefully sweet and easy to eat. 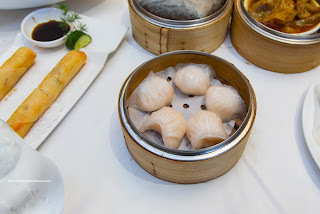 In general, the Dim Sum at Fortune Terrace was above average with some highlights. Yes, the pricing is definitely on the higher end and for many, it just isn't worth it. I wouldn't mind coming back, but just not very often.